Broad-Based Strength: 497 / 499 S&P 500 companies have reported for Q1 and sales and earnings growth is +8.2% YY & +23.7% YY, respectively. 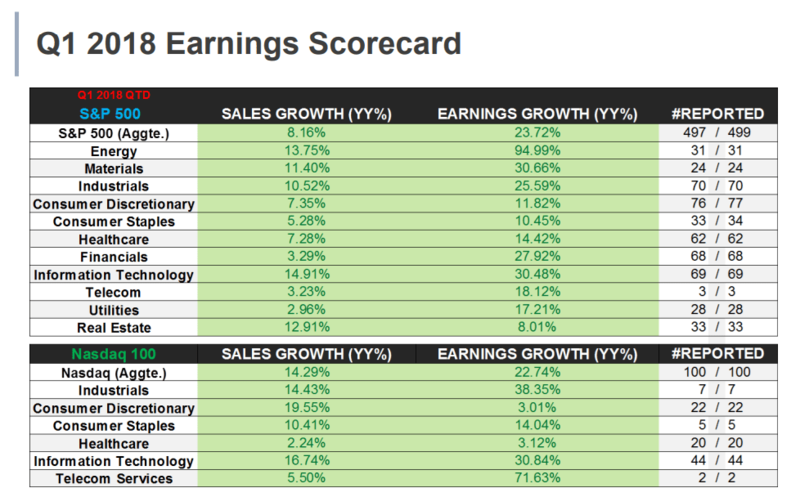 For context on how growth rates have held in, sales and earnings growth rates were tracking +9.4% & +25.1% YY at the halfway point. For the second consecutive quarter, every sector has reported growth on both the top & bottom line. Sales Growth: Sales growth for the S&P 500 index in aggregate is tracking +8.2% YY. This marks the fastest pace of top-line growth since Q3 of 2011. Like earnings, this will mark the 7th consecutive quarter of sales growth and peak second derivative acceleration. Information Technology: The sector faced its first difficult comp this quarter. Going into reporting season, consensus Bloomberg estimates for the sector were for +20.6% YY earnings growth on top of 21.7% YY earnings growth in Q1 of 2017. Information Tech companies handily beat estimates. The 69 Tech companies reported YY earnings growth of +30.5%. Want to know where we go from here and the investing implications? Sign-up for ETF Pro and get our Macro team's favorite ETF ideas each month.